Old Dogs - Great Friends. Yes dogs can be Seniors too. And often they can be abandoned or abused and because of their age, they are more difficult to find a home for than a cute little puppy. All of our dogs live in Sanctuary-approved foster homes until a permanent home can be found. 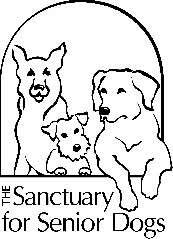 Senior dogs too ill to be safely adopted stay in a Sanctuary hospice foster home for life. All senior dogs are spayed or neutered prior to placement. The fourth Sunday of every month is ADOPTION SUNDAY! Visit the Adoption & Education Center between 2:00 and 4:00 PM to meet several of our dogs looking for homes. Interact with senior dogs, look for a new best friend, or just drop by for an old dog fix and some good conversation. But don't miss Adoption Sundays. If there is a particular dog you are interested in, please let us know, and we will make every effort to have that dog in attendance. Please come to visit us at 4456 Broadview Road in the historic Old Brooklyn neighborhood of Cleveland, Ohio. We always have at least one friendly senior dog with us, sometimes a foster looking for a new home, sometimes a therapy dog just waiting to give some love and affection, sometimes a dog adopted from the Sanctuary. No dogs are housed at the Adoption and Education Center. We are open limited hours as volunteer help is available. If you can spare 2-4 hours a month to staff our office space, please contact us. Our hours of operation will grow as our volunteer coverage grows.